Get deep with the multi-functional LFO, create a sequence of randomized preset states, or modulate parameters using an audio signal – this set of envelope followers and other device controllers can reinvent how you use your instruments and effects, and take your modulations to the molecular level. A step-sequenced modulator and envelope generator allowing quick creation of automated patterns and creative modulations. 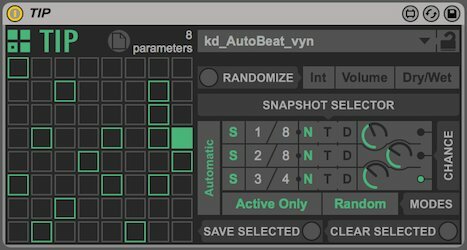 Control the target parameter via steps, creating sequences with controls like swing, time resolution and time variation. You can also adjust envelopes, set independent lengths for each step and adjust the smoothness of transitions between these steps. An envelope follower for modulating any parameter using an audio source. You can band-limit an incoming signal, then shape the output using a host of functions and response parameters.The display offers accurate visual feedback on how the resulting envelope will control your target parameter. 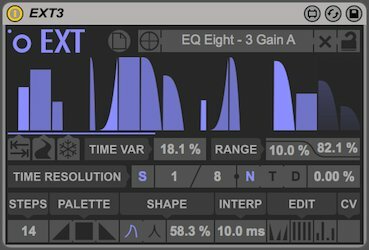 A fully customizable LFO with a comprehensive set of tools for crafting perfectly shaped control signals: six blendable LFO waveforms, advanced wave shaping parameters, cycle repetition controls and more. TED can even output CV/GATE, so can act as a function generator for modular systems. A unique grid-based device controller with which you can take up to 64 snapshots of your target device’s entire range of parameters and store them within a cell of TIP’s grid. Then switch between snapshots by designing automations or triggering automatically using random and other definable functions. You can also randomize up to 264 of any device’s parameters in an instant, with the option to exclude volume and dry/wet functions. Spectrum Effects includes two radical spectral processing devices capable of a range of effects. 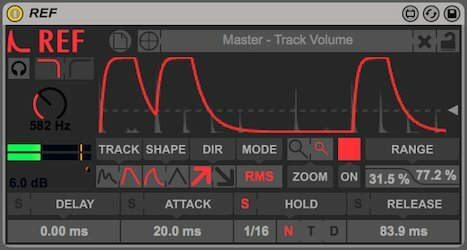 Warp and mangle your audio into mayhem, or add subtle harmonic touches - you decide which. In the studio and at the gig, Spectrum Effects adds an instant dynamic catalyst to your Live set.